In our example, we’re going to cut it back from a full CRUD Controller and implement three basic actions: new, create, and show. 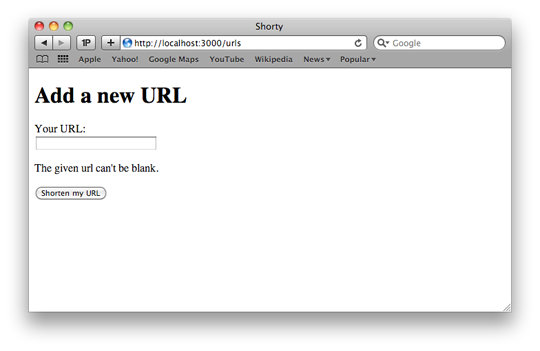 When the user hits thenew action, it will render a new URL form. 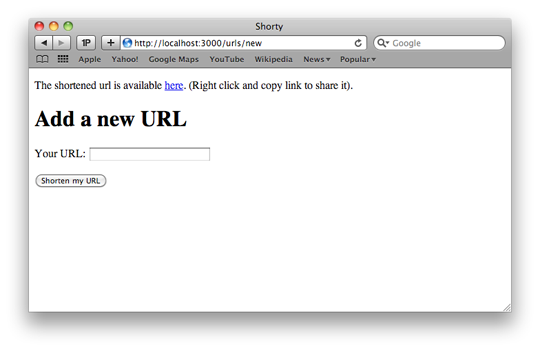 This will in turn hit the create action when we submit the form, and attempt to create the URL object. Save the file, switch back to the command prompt, and run rake routes. This will print out a list of all our routes. As you can see, Rails automatically set up three urls for us—GET /urls/new, GET /urls/:id, and POST /urlspointing to the new, show, and create actions respectively. 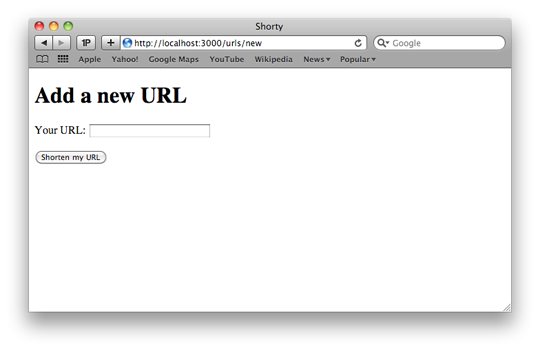 When the user hits the new page, it will set the @shortened_urlinstance variable to a new, unsaved URL object (we use @shortened_urlas our instance variable instead of @url, as the latter is used internally by Rails). Save the file. One important point to note here is that our choice of Model name—Url—has led to potentially confusing routes (for example new_url_url). To understand what this means exactly, we just need to remember the output ofrake routes. In there, we saw a route with the name new_url (among others). Rails automatically provides us with the new_url_url method (if our resources call in config/routes.rb had :posts instead of :urls, it would benew_post_url instead) as well as the _path equivalent; for examplenew_url_path. The difference between the two is that _url variants include the host, port, and protocol, whereas the _path variants include only the path and query string. To try it out, go back to the terminal, restart the Rails server if you closed it, and then point your browser to http://localhost:3000/. 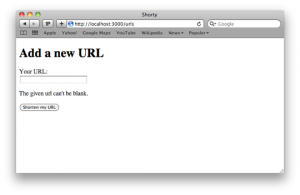 If all went as expected, your browser should have automatically been redirected tohttp://localhost:3000/urls/new. 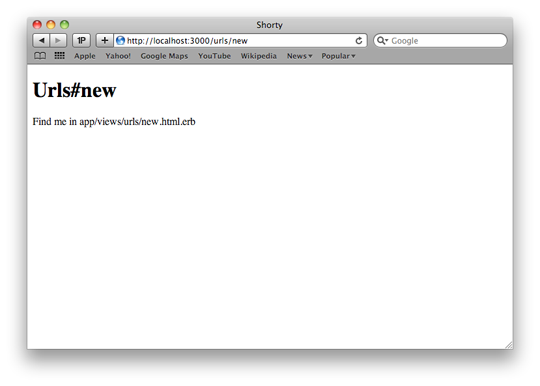 Then, at runtime, Rails will interpret the ruby portion to generate our HTML. Since our application is very simple, we’re only going to have to edit two views: the app/views/urls/new.html.erb file and our layout,app/views/layouts/application.html.haml. 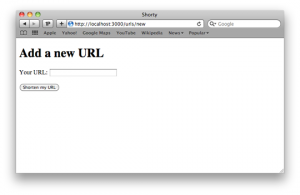 If you click on Shorten my URL without any URLs entered into the Your URLfield, you will receive the following error page. 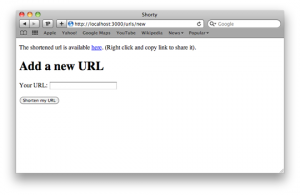 If you enter a valid URL into the Your URL field and click Shorten my URL(for example http://google.com/), you’ll see the following image.